Burkerts Type 2103 ELEMENT Hygienic Diaphragm Valvebenefits from a new tube valve body, manufactured using Burkerts patented hydroforming technology. “The Burkert Type 2103 is an FDA approved externally piloted diaphragm valve consisting of a pneumatically operated piston actuator, a diaphragm and a 2/2 way hyrdorformed tube valve body.” comments Gary Hopkinson. Hermatical seperation of fluids from the operating mechanism. Optical design for hygienic environments. Easy integration of automation units with ELEMENT. Burkert's new tube valve body is manufactured using Burkert's patented hydroforming technology which is used to create process valves. Ian Webster, Burkerts Field Hygienic Processing Segment Manager said: “This new manufacturing process allows us to manufacture variants that are as much as 75% lighter than forged housings." "The reduced volume of material means that the energy requirement for both heating and cooling during cleaning processes is also greatly reduced." “The hygienic design and clean ability of the new valve body has been shown to be comparable with that of stainless process pipework and has been certified under EHEDG Type EL, Class I." 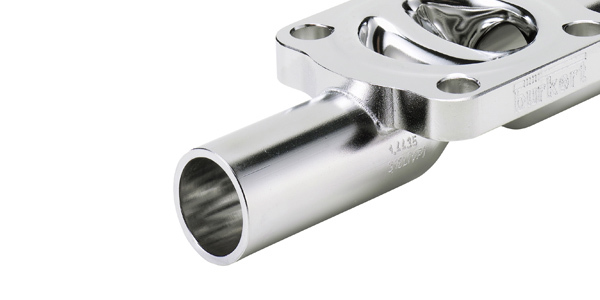 Burkert’s manufacturing process starts with the flange, which is laser cut and milled, and the tube, both of which are manufactured from 316L Stainless Steel. The tube is placed in a mould, filled with a water-oil emulsion and subjected to around 3,000 Bar of pressure, in order to produce the required flow path to and from the weir. The flange and tube are then laser welded together. Once welding has taken place the new component is annealed (heated and cooled slowly) in order to relieve residual stress within the material; in addition to increasing its durability and corrosion resistance. This is enhanced by precision machining of the surfaces of the flange before the final polishing stages are completed. The whole process is now automated and uses an abrasive paste that is repeatedly pumped through the valve body in order to achieve a surface finish of less than 0.6 µm; producing a uniform surface which is then electro-polished to give a near mirror finish for all areas that come into contact with the process media. Fluid control systems within hygienic applications demand high standards in terms of cleanability which can be affected by a number of design characteristics. 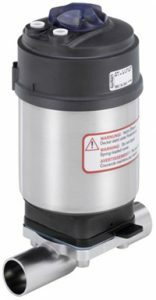 The base material is normally 316L Stainless Steel which requires an excellent surface finish in order to maximise the efficiency of the clean-in-place (CIP) process that is used to sterilise the process pipework. Coupled with excellent thermal properties, the design of process valves has become a complex process. Take a closer look at the Burkert Type 2103 ELEMENT Hygienic Diaphragm Valve and the accompanying datasheet. To discuss your process application in more detail please call us on +44(0)1822 855600, +44(0)161 480 5700 or contact our technical department via email.